As with every new Solar year in Feng Shui you must place a very special Master cure and the most powerful and important cure and enhancer in 2017 is called a Cai Yuan Guang Jin Master cure and must only be used in a Yin Fire Rooster (Ding You) year; this powerful amulet and protective talisman cure is used during Yin Fire Rooster years to enhance the annual #8 wealth star. This cure is used to protect and enhance wealth and good luck in 2017, especially for the eldest son or male of the home or office if a son is not present and more so if you run a business from home although equally needed for females especially for wealth. This Cure is only known to a few specialist Feng Shui Grand Masters and in the old days and even now in Asia, you would need to employ a specialist Feng Shui Grand Master to call at your home or business where they would come along with a specialist zhuanke (seal carver) who would spend many hours carving the secret inscriptions on to the square earth plate in to a Lo Shu grid relevant for the Ding You year and would be carved on a large piece of translucent emerald-green Jade. The seal carver (zhuanke) and Feng Shui Master was traditionally hired by emperors and the very wealthy and was seen as a symbol of great wealth and power and this took many years of studying to perfect this specialist art form. The Cai Yuan Guang Jin Master cure which translates roughly to read “Money and treasures will be plentiful” would then be placed in the east of your home or office during the Yin Fire Rooster year and then setting the two types of very special thought form quartz crystals (four crystals in total) and four Chinese i-ching (yin & yang) coins along with a solid gold wealth ingot and this would cost a small fortune in the materials alone without compensating the seal carver and Feng Shui Master for their time and skills and was obviously only available to the very rich which is still the case in many parts of the world and the reason why we create these powerful cures, so all can afford them at a fraction of the cost. To create this enhancer and cure, the Feng Shui Master would use a large piece of translucent emerald-green jade which was the most sought after type of crystal and would carve it in to a dish which symbolised an offering dish for the year, filled with precious gold symbolic items and rare crystals. Carving jade is an art form on its own and because jade has a grain similar to wood, it would often become brittle on the first attempt which would cause a rippling effect on one side due to the Jade splintering which prompted Feng Shui Masters to adapt this Cure and create a sheng cycle which involves incorporating all of the five elements in to one Cure, creating a very powerful synergy between all elements. Jade is increasingly becoming very hard to find and was traditionally known as ‘the royal gem’ and the price has gone up massively in recent years which is why a glass dish is used in modern times and this took us a long time to source as we had to have the splintered, rippling effect on the base. 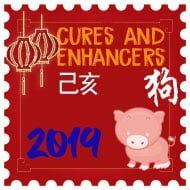 The most crucial part of this cure and enhancer is the presence of all five elements in one cure which is said to create a perfect synergy in the east this year and also promote new and protect existing wealth for the home or office it is placed in for the Yin Fire Rooster year. Those who displayed the Cai Yuan Guang Jin in their home would have to use a solid gold wealth ingot to place in the centre of the Cure as an offering of riches for the year ahead along with four i-ching coins to place in the four corners joined with two pieces of red jasper crystal which is said to bring protection and determination and two pieces of spearite crystal used to resolve problems and also a very powerful healing crystal. 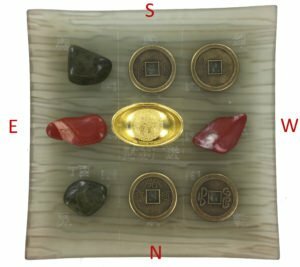 Both of the two rare semi-precious quartz crystals are used to work in synergy with the inherent elements of the Luo Shu Trigrams and annual flying stars giving total protection for wealth, health & peace of mind and enhancing the #8 star from the east, the crystals and i-ching coin are placed as shown below. Follow the directions in the photo below to ensure accuracy of placement. This cure must be placed as near to the east of your home or office (if it cannot be placed in the east, place in the southeast part of your building) exactly as shown below with the four auspicious dynasty Chinese I-ching coin, gold coloured wealth ingot, the two spearite crystals and two red jasper crystals. This earth plate engraved arrow must face south (the instructions below show you how to set this cure up) even if you do not own a compass for northern and southern hemispheres so it does not matter where in the world you live. How do I find east without a compass? 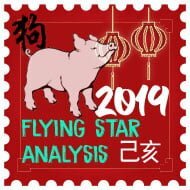 This method is not as accurate as using a magnetic compass but at least it will give you a rough idea where south (not magnetic south) is located although as you are practising traditional Feng Shui you should invest in a good compass. 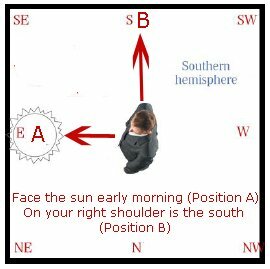 If you live in the northern hemisphere UK, Europe, USA, Canada etc you should go out at sunrise and face the sun which is roughly where east is located. The north will be on your left shoulder and you would then find south on your right shoulder as shown in the photo. 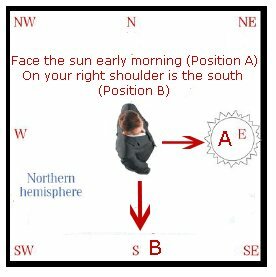 If you are in the southern hemisphere Australia, New Zealand, south America, parts of Africa etc you will do the same and go out at sunrise and face the sun which is where east is located. The north will roughly be on your left shoulder and you would then find south on your right shoulder as shown in the photo. Place each crystal as shown on the photo below. Some crystals will vary in colour and size but you will be able to identify each one from the description, Chinese character and photo below. Please appreciate that these genuine quartz crystals are formed over millions of years and you will find imperfections, which is the beauty of them. Once you have placed all the crystals and coin as shown and placed in or as near to the east of your home and/or office as possible and try to visualise a white dome around this powerful cure and think of this protective dome around your building. This enhances the cure and enhancer and gives further protection for all the occupants of the building. Do not worry if you cannot visualise, as I know some people struggle with this and the cure will work for you regardless. Once you activate this earth plate cure, this is a very strong wealth, career, success and romance area for 2017. Try and store your important financial papers here like pensions, stock portfolio etc in the east or as close to this master cure as possible. 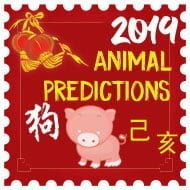 If you use symbolic cures this is where you should place your three-legged Toad facing your Sheng Chi direction for wealth or a pair of Mandarin Ducks for romance. 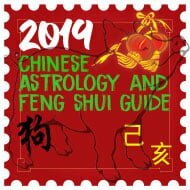 You can check our website or use our Feng Shui software to find your most auspicious Sheng chi direction. Please appreciate that these genuine quartz crystals are formed over millions of years and you will find imperfections, which is the beauty of them.